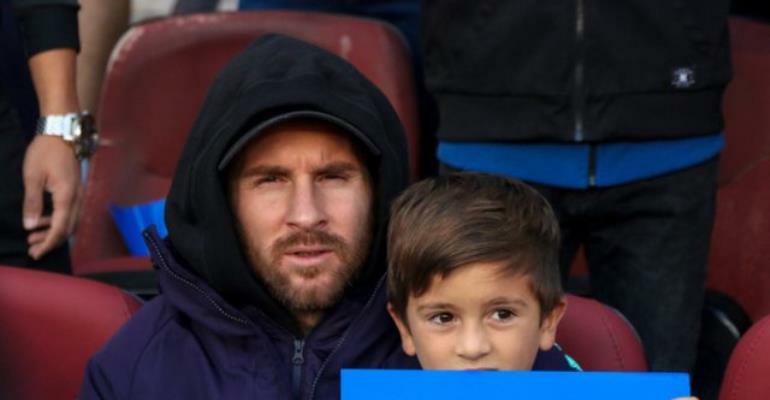 Barca captain Lionel Messi claims his son Thiago asked him why fans want to "kill" him in Argentina after his latest set back on the international stage. The 31-year-old returned to the La Albiceleste squad for last week's friendly matches against Venezuela and Morroco, but he was forced to return to the Camp Nou early after sustaining an injury. The five-time Ballon d'Or winner has often been made a scapegoat in his homeland for the national team's recent failures, which is one of the reasons he took a break after the 2018 World Cup. Messi's relationship with the South American media has always been fractious and he even announced his retirement from international duty in 2015 after missing out on winning the Copa America. The Barca talisman later reversed his decision and led his country to the World Cup finals in Russia last year, but a last-16 exit at the hands of France did little to help cease hostilities. "It is hard, my son is always looking on YouTube and saw a video," he began. "He asked me why in Argentina they want to kill me! "But I like to keep going. I still want to win something with the national team. I am going to play all the important games. We already reached a World Cup final [in 2014] and this is not that easy". He continued by dismissing reports suggesting that he overrules the coaching staff for Argentina, adding: "I don't want to make a reality all the lies they say about me. "I don't decide on the national team coaches. I am hearing these bad things and it is hard to enjoy in that scenario. "If we had won the World Cup in Brazil all would be different today. We lost because of small details. After that there were a lot of messes and I think the press should have dealt with it in a different way". Messi also gave an insight into the role the Albiceleste manager Lionel Scaloni has asked him to take up in the team as they start looking ahead to this year's edition of the Copa America, though he feels the team needs more experience before they start to win titles again. "He wants a strong and a solid team which doesn't concede chances, doesn't suffer in defence and that is safe without the ball," said Messi. "He wants me to start on the outside before earning superiority on the inside. He especially wants us to build a hard team. "The national team is living in a changing moment and obviously there's a big respect for that team all around the world. For what it means, what it earned. "But we must be realistic. If you want to be a challenger you must earn it on the pitch and there's a lot of work to do before we become a challenger. "A lot of players have only seven or eight games with the team so we must be patient. We can become a force because there's enough potential." Barcelona resume their La Liga campaign this Saturday, with a crucial derby against Espanyol to negotiate as they aim to protect their 10 point lead at the top of the table. Messi is in line to feature, after returning to full training following a swift recovery from the groin injury he suffered on Argentina duty.